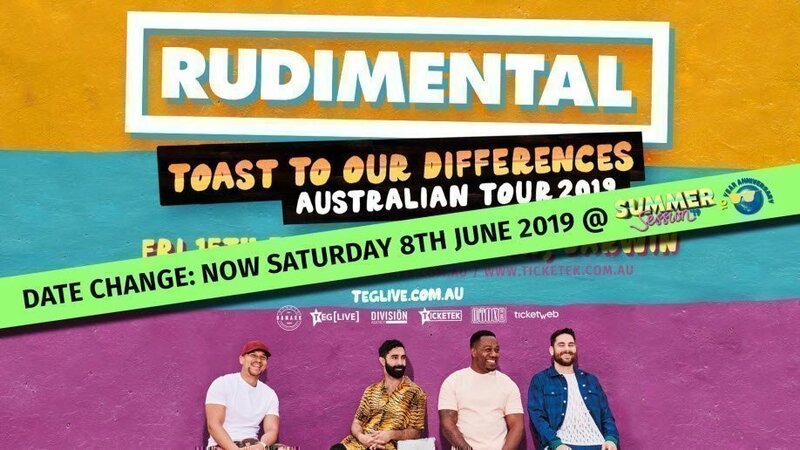 East London luminaries, Rudimental have announced they’ll be heading back to Australia for a national tour in February 2019, as part of their Toast To Our Differences world tour to celebrate the release of their new album that’s set to drop globally on January 25, 2019. The tour will see Rudimental play at the iconic Mindil beach on Friday 15th February 2019! There’s a lot of love for these guys here in Australia (one of their best performing markets) and it’s been over two years since the full band last toured here. But the good news is, they’re pumped to get back to our shores after being reminded of just how fun our Aussie audiences are when they headlined Snowtunes with a DJ set earlier this month. Piers Agate enthuses, "We can't wait to come out to Australia again. It feels like our second home, we're gonna be playing the new album and touring with new singers and bringing a new spin on that Rudimental vibe". Tickets $99.80 including all credit card and booking fees. • All patrons must have a valid ticket to access the event. • This is an all ages licensed event. • Children 13 years and under will be admitted free of charge with a ticket holding guardian. • The promoter recommends any minors under 16 years of age who attend the event are accompanied by a ticket holding guardian. • Carers accompanying a disabled or restricted mobility person will be admitted free in the company of the ticket holding person they are caring for. This is valid for one carer per person. • Every person entering the event will receive a wristband if this wristband is removed for any reason you will be removed from the event or you will need to purchase an admission ticket. • You may be refused entry if your ticket was purchased from an unauthorized ticket seller or ticket scalper. Defaced tickets will not be accepted. • Patrons who wish to consume alcohol must have valid photo identification. The Promoter reserves the right to refuse any patron without appropriate identification. The only forms of valid photo ID that will be accepted are a current Australian driver’s licence, a current passport or a current state issued proof of age card. • Anyone found to be supplying or buying alcohol for a minor will be evicted from the venue and will possibly face criminal charges. • Trespassers and anyone assisting trespassers will be evicted from the Venue. • Smoking is only permitted in marked designated smoking areas. • The Promoter and the Venue shall not be held liable for any loss, injury or damages sustained entering or within the premises. • Small still cameras (including those with a recording function) and mobile phones are permitted for personal use only. Please respect the privacy of all other patrons, artists and service providers when using your camera or mobile phone. • As members of the audience, ticket-holders consent to being included in photos, sound and live video recordings that can be used by the promoter approved media outlets for promotion of the event. • All persons, bags and containers are subject to a full search at entry to ensure the safety of patrons. Prohibited items will be confiscated (and only returned at Promoters discretion) except for illegal drugs, which will be handed over to police. The Event organisers do not take any responsibility for confiscated items. • It is a condition of entry that all patrons agree not to behave in a manner that interferes with the enjoyment of other patrons. Promoters and Security reserve the right to eject any person contravening this. • DANGEROUS ACTIVITIES WILL NOT BE TOLERATED. This includes aggressive moshing, stage diving, crowd surfing and climbing. Patrons participating in these dangerous activities will be evicted without right to re-entry or refund. The Promoter accepts no liability for any injuries or damages caused by these activities. • In the case of an emergency evacuation or situation, please follow all official directives. • The Promoters or the event will not be held liable for any hearing damage or loss. Use earplugs if necessary. • The Promoter reserves the right to change the festival line-up without prior notification. In the event of a change of festival lineup, refunds will not be available. • No BYO alcohol, soft drinks, juice, milk, energy drinks, flavoured water or sports water is permitted. • No illicit drugs are permitted. • No glass, knives, weapons, lasers, fireworks, umbrellas, prams, camp chairs, picnic rugs, bulky items (such as eskies, sunshades, tents, tables) or animals are permitted. • No outside food is to be brought into the venue. • Professional still cameras (such as an SLR), professional video cameras (including go-pros), sound recording equipment and professional lighting and tripod set ups are not permitted without written authority from Hamark Holdings Pty Ltd.
• Special requirement food that can not be reasonably purchased inside the venue. There will be an ATM at the event. Eftpos facilities will be available at the front gate to purchase entry tickets and at all bars. There will be a First Aid Marquee with trained First Aid personnel on site. Any person over 18 is free to enter and exit the venue up until 7pm as long as their wristband stays intact. For any persons under the age of 18 years, pass outs will not be granted. If it does rain the show will go ahead unless conditions are deemed to be dangerous. If an event does not go ahead due to this reason, the show will be rescheduled. The decision to cancel a show will be made on show day. In the event of inclement weather patrons should check this website BEFORE departing for the show for messages regarding traffic, parking or wet weather arrangements. Lost property will be kept at the box office throughout the event and will be held at The Cavenagh Hotel Reception for three days before being taken to the Mitchell Street Police Station. No responsibility is accepted by the Promoter for property. Contact us through our Facebook page for inquiries. No. Once the ticket sale is processed the purchase is final. While obviously we sympathize with you if you lose your ticket, we are unable to reissue. Even if we have a record of your purchase, we cannot be certain that other less scrupulous members of the public will not use the ticket. Please treat your ticket like cash, as they are irreplaceable. No refunds or exchanges except as required by and/or specified by the Entertainment Industry Code of Fair Practice. Incorrect purchases are NOT guaranteed a refund and are at the discretion of the promoter. If you are asked to leave the event for any reason or you choose to leave for any reason you will not be entitled to a refund.